Natural sleep remedies such as Sleep Aid may help you get a good night’s rest. In addition, consider adding foods such as bread, pasta, apples and bananas – all high in carbohydrates – to your diet. Since carbs raise serotonin levels, it makes sense that a dinner full of these heavy foods would help you drift off to sleep. ABC News reports that snacks high in carbohydrates and low in protein may help the brain create tryptophan, as well. This year, the Perelman School of Medicine at the University of Pennsylvania released a study showing that varied diets may help regulate a healthy sleep cycle. The team took a look at the Centers for Disease Control and Prevention’s 2007-2008 National Health and Nutrition Examination survey. Everything, including a glass of water, was tracked in the diets of a group of the U.S. population that had a range of ages and demographics. Those surveyed were split up by their sleep pattern – very short, short, standard or long. 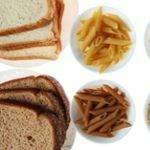 Researchers found that some of the top contributors to differences in the duration of sleep were proteins and carbs. The study showed that individuals with very short sleep patterns maintained diets that were low in total carbohydrate intake. Other interesting data found through this study was that caloric intake ranged when it came to the amount of sleep people were getting. Those that were classified as short sleepers consumed the most amount of calories and long sleepers consumed the least. So, for a dinner that’s eaten about four hours before bedtime, think potatoes or pasta (just not too much) if you aren’t getting enough sleep at night. If you’re in need of a snack to help you sleep, try an apple or banana with peanut butter about 30 minutes before you got to bed. With so much stress in today’s world from work, technology, family commitments and other obligations, it can be a challenge to get a good night’s sleep each evening. Luckily, there are herbal remedies that can help you fall asleep naturally because lack of sleep can have negative effects on your health. A recent U.S. study published in the journal Sleep Medicine found that people who get less than six hours of sleep a night are more likely to have high blood pressure, high cholesterol, diabetes and be obese. Additionally, this is the first trial that looks at differences between racial and ethnic groups and learned that the effect is strongest among African and Hispanic Americans. The study took place at the Center for Sleep and Circadian Neurobiology at the University of Pennsylvania. Researchers looked at data from a nationwide survey from 2008 and divided the results from more than 5,000 participants into three groups: very short sleepers getting less than five hours a night, short sleepers getting between five and six hours and long sleepers getting more than nine hours. Through this, the researchers learned that very short and short sleep are associated with poor health. Very short sleepers have twice the likelihood of high blood pressure and high cholesterol compared to people sleeping seven or eight hours a night. Very short sleepers are also 75 percent more likely to develop diabetes and have a 50 percent higher chance of being obese. Similarly, short sleepers have a 20 percent greater risk of high blood pressure and obesity. Grandner said that quantity of sleep isn’t solely what’s important. Other aspects like insomnia, sleep apnea and waking up a lot during the night could also be related to heart disease, diabetes and obesity. Additionally, Kristen Knutson, who studies sleep and heart health at the University of Chicago Department of Medicine, told Reuters that there’s no consensus on the ideal amount of sleep for health. This is because there are variables that determine how much sleep different people need, but studies show most people need between seven and eight hours to be at their healthiest. Sleep better naturally If you have trouble getting enough sleep and need a natural sleep remedy, try Western Herbal and Nutrition’s Sleep Aid. It uses the essential amino acid L-Tryptophan. This is a precursor for o melatonin, a hormone involved in sleep patterns, and L-Tryptophan is the only substance that can be converted into serotonin to maximize sleep. Are your allergies making it hard to sleep?